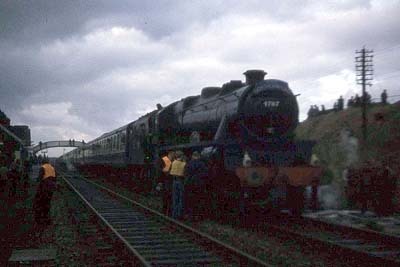 (1) 44767 failed at Greenhead (milepost 40, shortly after passing through Haltwhistle) and was assisted (pushed) to Low Row by 47280. 26034 then dragged the train to Carlisle before removing 4767 for repairs. (3) Plus 4767 and train. (4) 55002 was booked motive power but was not available. (5) Gordon Lacy comments: It became apparent quite early on that the Black 5 wasn't steaming well! As if that wasn't enough, there were high winds & rain to contend with. A signal failure at Prudhoe & a long stop outside Haltwhistle put us 26 down. When we ground to a halt at mp40, we thought that was the day over! 47280 eventually appeared & propelled the whole train forward to Low Row where the unexpected sight of 26034 was waiting to cross over to relieve the 47 & drag us on to Carlisle. The fitters worked their socks off to get the loco fit enough to take up its return working. I was fortunate enough to (stereo)tape record the ensuing southbound ascent of Ais Gill from the, by now, second coach, the earlier steaming problem having been sorted! The Leeds crew change was subsequently made at Keighley, due to still being a full hour down. York 18L00a ~ 18L35d [P14] 19.06 ~ ??.?? Stockton 19.23a ~ 19.25d ? Hartlepool 19.48a ~ 19.50d ? Sunderland 20.15a ~ 20.17d ? King Edward Bridge Jn 20/45 ?